Marketing Information: Manage your power more efficiently with the Cables To Go 1-to-2 Power Cord Splitter. This splitter features one male 3-prong plug which splits to two female 3-prong plugs. Simply plug the power cord splitter's male prong into an outlet and you're ready to power multiple electronic devices. Saves space by eliminating extra cords and it keeps your surge strips and UPS outlets free. 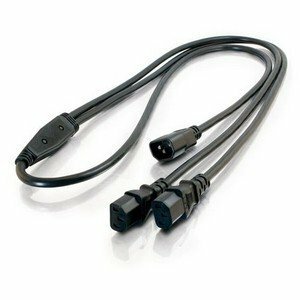 This cord is ideal in a compact workplace or home office where there is a need to run electronic equipment in a limited space.